Who doesn't want an empress? 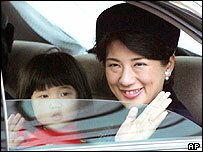 Japan's foreign minister has questioned plans to allow female royal succession, the first Cabinet member to do so. Taro Aso called for more debate before a bill proposing to change the Imperial Household Law's succession rules comes before parliament later this year. More than a quarter of members of both houses of parliament are said to oppose the bill, with conservatives claiming 176 have signed a petition against it. The imperial family is facing a crisis, having produced no boys since 1965. The Imperial Household's main succession hopes lie with four-year-old Princess Aiko, the daughter of Crown Prince Naruhito and his wife Masako. Opinion polls suggest that a large majority of the Japanese public supports the move, but conservatives claim it would end an unbroken male line stretching back 2,600 years. Mr Aso is the first Cabinet minister openly to question the female succession proposal, expected to go before parliament before the current session ends in June. "Is this a bill we must handle rashly?" he said to reporters. "It is necessary to have more debate." 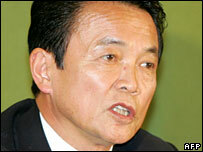 Finance Minister Sadakazu Tanigaki also voiced caution about the change. "It would be desirable if it could be approved smoothly after seeing a firm national consensus," he was quoted by the French news agency AFP as saying. About 40 Japanese lawmakers joined a rally in Tokyo on Wednesday to protest against the government plans. Former Trade Minister Takeo Hiranuma told supporters that the move could dilute the imperial line if Princess Aiko married and had children with "a blue-eyed foreigner". Prince Tomohito, a cousin of Emperor Akihito, has previously suggested that Crown Prince Naruhito take concubines to ensure a male heir, or that families who lost their royal titles after World War II be reinstated. The BBC's Jonathan Head in Tokyo says the brutal reality confronting conservatives, though, is that no males have been born into the male line for 40 years.